In this section we introduce supply shocks. Supply shocks are events that shift the aggregate supply curve. We defined the AS curve as showing the quantity of real GDP producers will supply at any aggregate price level. When the aggregate supply curve shifts to the right, then at every price level, a greater quantity of real GDP is produced. This is called a positive supply shock. When the AS curve shifts to the left, then at every price level, a lower quantity of real GDP is produced. This is a negative supply shock. This module discusses two of the most important supply shocks: productivity growth and changes in input prices. In the long run, the most important factor shifting the AS curve is productivity growth. Productivity means how much output can be produced with a given quantity of inputs. One measure of this is output per worker or GDP per capita. Over time, productivity grows so that the same quantity of labor can produce more output. Historically, the real growth in GDP per capita in an advanced economy like the United States has averaged about 2% to 3% per year, but productivity growth has been faster during certain extended periods like the 1960s and the late 1990s through the early 2000s, or slower during periods like the 1970s. A higher level of productivity shifts the AS curve to the right, because with improved productivity, firms can produce a greater quantity of output at every price level. The interactive graph below (Figure 1) shows an outward shift in productivity over two time periods. The AS curve shifts out from SRAS0 to SRAS1 and LRAS0 to LRAS1, reflecting the rise in potential GDP in this economy, and the equilibrium shifts from E0 to E1. Figure 1 (Interactive Graph). Shifts in Aggregate Supply. Productivity growth shifts AS to the right. A shift in the SRAS curve to the right will result in a greater real GDP and downward pressure on the price level, if aggregate demand remains unchanged. However, productivity grows slowly, at best only a few percentage points per year. As a consequence, the resulting shift in SRAS, increase in Q and decrease in P will be relatively small over a few months or even a couple of years. Higher prices for inputs that are widely used across the entire economy, such as labor or energy, can have a macroeconomic impact on aggregate supply. 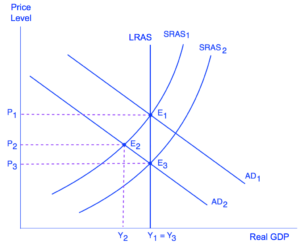 Increases in the price of such inputs represent a negative supply shock, shifting the SRAS curve to shift to the left. This means that at each given price level for outputs, a higher price for inputs will discourage production because it will reduce the possibilities for earning profits. The interactive graph below (Figure 2) shows the aggregate supply curve shifting to the left, from SRAS0 to SRAS1, causing the equilibrium to move from E0 to E1. The movement from the original equilibrium of E0 to the new equilibrium of E1 will bring a nasty set of effects: reduced GDP or recession, higher unemployment because the economy is now further away from potential GDP, and an inflationary higher price level as well. For example, the U.S. economy experienced recessions in 1974–1975, and 1980–1981 that were each preceded or accompanied by a rise in oil prices. In the 1970s, this pattern of a shift to the left in AS leading to a stagnant economy with high unemployment and inflation was nicknamed stagflation. Figure 2 (Interactive Graph). Shifts in Aggregate Supply. Higher prices for key inputs shifts AS to the left. Conversely, a decline in the price of a key input like oil, represents a positive supply shock shifting the SRAS curve to the right, providing an incentive for more to be produced at every given price level for outputs. From 1985 to 1986, for example, the average price of crude oil fell by almost half, from $24 a barrel to $12 a barrel. Similarly, from 1997 to 1998, the price of a barrel of crude oil dropped from $17 per barrel to $11 per barrel. In both cases, the plummeting price of oil led to a situation like that presented earlier in Figure 1, where the outward shift of SRAS to the right allowed the economy to expand, unemployment to fall, and inflation to decline. Along with wages and energy prices, another source of supply shocks is the cost of imported goods that are used as inputs for domestically-produced products. In these cases as well, the lesson is that lower prices for inputs cause SRAS to shift to the right, while higher prices cause it to shift back to the left. Similarly, an unexpected early freeze could destroy a large number of agricultural crops, a shock that would shift the AS curve to the left since there would be fewer agricultural products available at any given price. When Does A Supply Shock Shift Potential GDP? This important question really answers itself. Suppose there is a decrease in aggregate demand, which is shown by a leftward shift in AD, as shown in Figure 2. In the short term, wages are sticky and output decreases along the SRAS, as we move from E1 to E2. Over time, wages decrease and as they do, the SRAS shifts to the right due to the increase in firms’ cost of production. The SRAS continues to shift until GDP has returned to potential. Graphically, we move from E2 to E3. Because this event was caused by a demand shock (i.e. a shift in AD), it had no effect on potential GDP. The supply of labor didn’t change, nor did labor productivity so LRAS stays constant, though SRAS shifted. LRAS shifts only when the potential GDP increases or decreases. Figure 3. A Demand Shock. When AS shifts in response to a shift in AD, potential GDP (and LRAS) is unchanged. Rather, the model adjusts back to the original potential GDP, moving from E1 to E3. Review things that shift aggregate supply in the following video. The video went over the following scenarios. Take a second look and quiz yourself on what will happen to aggregate supply in each situation. A significant increase in nominal wages. An increase in physical capital. A decrease in corporate taxes on producers. An increase in expected inflation.